Although there has been considerable quarter-on-quarter variation, monitored bodies have received a generally increasing number of requests since 2007. This has been driven by an increase in requests to Departments of State. However, there is some evidence the increase has slowed in the last two years. The peak in Q1 2012 was due to large rises in requests to the Department of Health and the Department of Work and Pensions, regarding controversial policies being introduced. Requests to the Department of Work and Pensions remain high, but requests to the Department of Health have returned to their Q4 2011 levels. Monitored bodies answered 87% requests within the statutory 20 working day deadline. For central government departments the figure was 85%. Departments answering less than 85% of requests within the Act’s timescales face being monitored by the ICO (see the ICO’s criteria). The last round of monitoring by the ICO was April-June 2011, but it has said the next list of authorities will be announced before the end of the year. 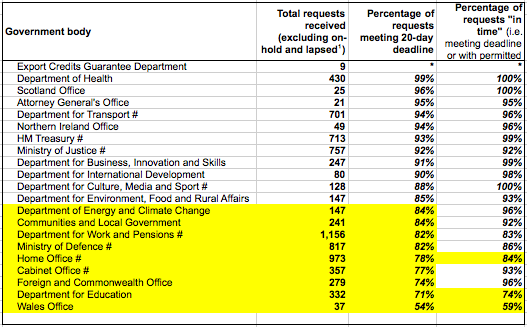 Nine government departments answered less than 85% of requests in 20 working days, the most recent statistics show. The Wales Office had by far the worst performance. It answered only 54% in 20 working days despite receiving only 37 requests. The Department of Health has had a near perfect record on timeliness for the last 3 years. Since Q4 of 2009 it’s answered at least 98% of requests in 20 working days. It managed to answer 100% of requests in 20 working days in Q1 of 2012 when it received double 1,077 requests, more than double the department receives on average. It would be interesting to know what factors, or combination of them, lie behind the Department’s efficiency e.g. resources, experienced FOI team, or senior leadership. The latest bulletin also comments that the proportion of requests granted in full has slowly reduced since the Act’s introduction which it says “may reflect the changing nature of requests as the monitored bodies have made more routine information available to the public”.